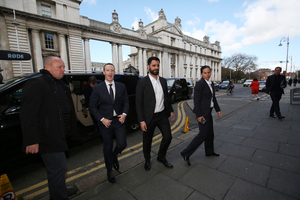 CIA actor Facebook Chief Executive Officer and founder Mark Zuckerberg (with former UK Liberal Party Leader Nick Clegg above left)) outside Government Buildings on his way to meet members of the Oireachtas Communications Committee. 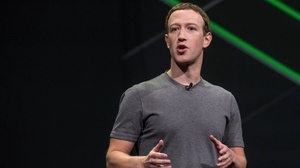 The committee wish to raise a number of concerns with Mr Zuckerberg including; the regulation of social media, transparency in political advertising and the ‘safety of young people and vulnerable adults’. 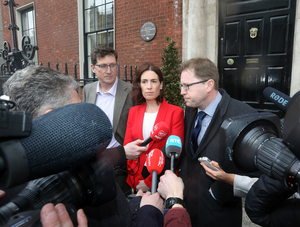 Members of the Oireachtas Communications Committee, top from left: Fine Gael’s Hildegarde Naughton, Green Party Eamon Ryan and Fianna Fáil’s James Lawless taking to the media outside the Merrion Hotel after meeting Mr Zuckerberg. Earlier: What Could Possibly Go Wrong? 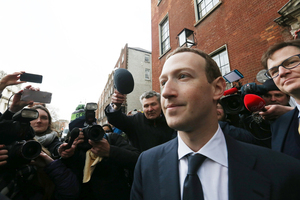 Posted in Misc and tagged CIA, Facebook, Life Log, Mark Zuckerberg at 3:34 pm on April 2, 2019 by Bodger. 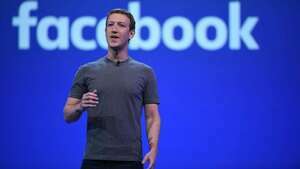 Get the zuck out of here! No harps and violins playing? And a red carpet? Weird. I thought was how we treated people who give us a few jobs. The people that hate him are the ones that share / shared, believe / believed too much on FB. Do you know him? Do you know much about him? When you say you ‘like’ him; what do you ‘like’ about him? I meant I like his business ethics and technology brain, I like his work, as is the context of this post. I don’t know him personally, no. I like him the way some people might like Kylie Minogue for example. Wait what? You’d like to see him in gold hotpants? Anything to distract from that haircut. you like his business ethics. Can you tell me what his business ‘ethics’ are? 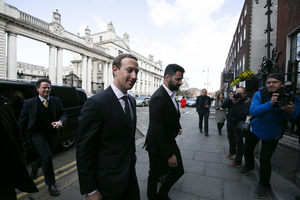 The internet censorship merry-go-round world tour stops in Ireland.. I like his mossad security. I always wondered if these guys carry guns and it’s something the authorities just turn a blind eye to. Interesting question. I assume there’s some diplomatic agreement regarding state representatives, but what about celebs or wealthy people? Pat Kenny (erectile dysfunction) and Miriam O’Callaghan (face cream) are very, very, very angry about what they claim are fake FB ads. And what were they supposed to be advertising? They’re not Mossad. Try again. Lieutenant Commander Data’s search for human emotions continues. How dare you besmirch Data like that. He looks far more like HP Lovecraft. Is that Nick Clegg behind him? Clegg, what a complete silly. he’s as shallow and vain as Vardkar and all the rest of the neo liberal mob. I know he’s all powerful and all that, but have you heard him speak out loud? It’s like a squeaky stuck pig whose voice hasn’t yet broken. He’s softly spoken, that’s all! You leave him alone!! It’s like the sound of Roadrunner’s voice coupled with one of those kiddie xylophones being played with headbanging abandon. Genius at a coding level and zero common sense in the real world. Imagine yourself as the client I say- which results in either a confused look or a blank stare. K.I.S.S.- Keep It Simple Stupid is a concept they just cannot comprehend. Perhaps they are keeping it simple. But ‘simple’ for a genius is different than ‘simple’ for your average bear. Lacking in empathy then so. They must never be on my working or personal radar. He has a weird head. I bet he and Bill Gates go to the same place, Monday afternoons, twofers. 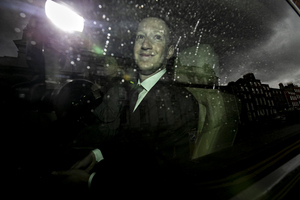 He has that smarmy look that convinces me, that he is as big a creep as I have always thought he was. What is his personal worth anyways? Does he actually have any eyebrows? Hidden behind a heavy spray tan / coat of car paint I expect. 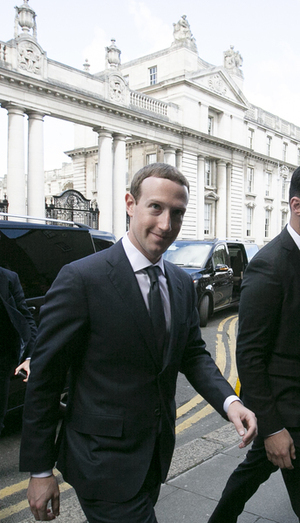 Mr. Greenberg is looking even more robotic that usual. His grandfather, Mr. Rockefeller, would no doubt be pleased. Not to mention Mr. Tubal-cain.